Have you ever been to a football game? How about in mid-November? In Canada? Man, was it ever cold. 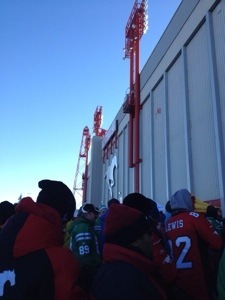 Last weekend, I went to McMahon Stadium in Calgary for about my third football game ever. 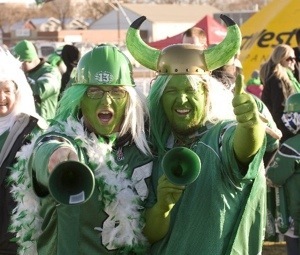 It was the first time I had ever been to an actual important game – the Western Canada Final. An intimidating thing to live up to, but this has been drilled in to me by most of my family since birth, so when I knew I was going to see the Western final, I certainly knew who I was cheering for, despite the fact that the game was in Calgary. Anyways, back to the cold. The terrible, lurking, skulking, freezing cold. I headed to the game, bundled up in layers upon layers of clothing underneath my winter jacket. I was told it would be cold, so at least I did come prepared. I mean, I’m from the Yukon. I can handle a little cold. But I’ve never been outside somewhere that cold, just sitting there. I could not believe how quickly it creeped right in and I was chilled. But there was something about sitting in those seats, bundled up and suffering together with fellow fans in the freezing cold that really makes you feel like you are a part of something. 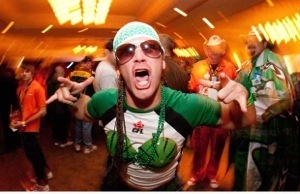 Even someone like me who is barely a football fan can feel totally included just by putting on a Riders jersey. Even better, the Riders came out with the win. 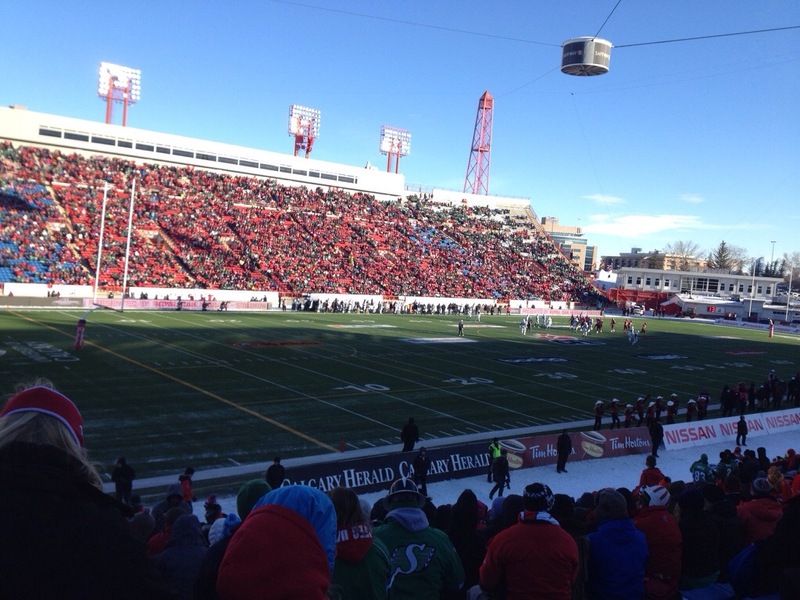 Last weekend I made a trip down to Calgary for a couple of firsts: my first visit to the Saddledome, and my first visit to McMahon Stadium (which was also my first November football game). I’ll write a post about the football game later, but in this post I am going to focus on the hockey game, and the game production specifically, since we all know I’m a bit of an event junkie. I want to preface this by saying that I did an internship with the Oilers event department while I was still in University, and I learned a ton about game production and execution during that time. This definitely makes me think about the production and processes behind any sporting event that I attend now, and can sometimes make me into an annoying person to attend a game with (due to my tendency to point out production flaws or call what’s happening before it happens or just talk about how I would do things differently if I were in charge). Due to spending Friday night playing a variety of sports until 7 AM, and then having a fairly snowy and stressful drive to Calgary on Saturday, I was pretty exhausted by the time it was the evening and time to head to the hockey game. I thought I would be nodding off in my seat, but the excitement of the game combined with the excitement of everything in between kept me alert. I have to say, I really enjoyed my first experience at a Flames game. Not because the Flames were playing of course – mostly due to the fact that my Oilers took them down in the end – but I really enjoyed the atmosphere that was created at this game. I don’t love the Calgary Flames, but I definitely enjoyed the “fresh” approach the organization takes to their game production. They tied in current events (ie. Movember) throughout much of the night, and showed a few great segments highlighting certain sponsors during breaks.Throughout the game, I felt that everything from the graphic design and video production used on the screen, to the segments presented during intermission was all very current. So basically, good work Calgary Flames. I’m not 100% sure what you are doing to make things click in the building, but it is working. Not to mention, I love the glow of red that seems to somehow be constantly be present throughout the stadium. I haven’t been to too many NHL venues, but I definitely want to return to the Saddledome for another game sometime – preferably to watch the Oilers crush the Flames again.